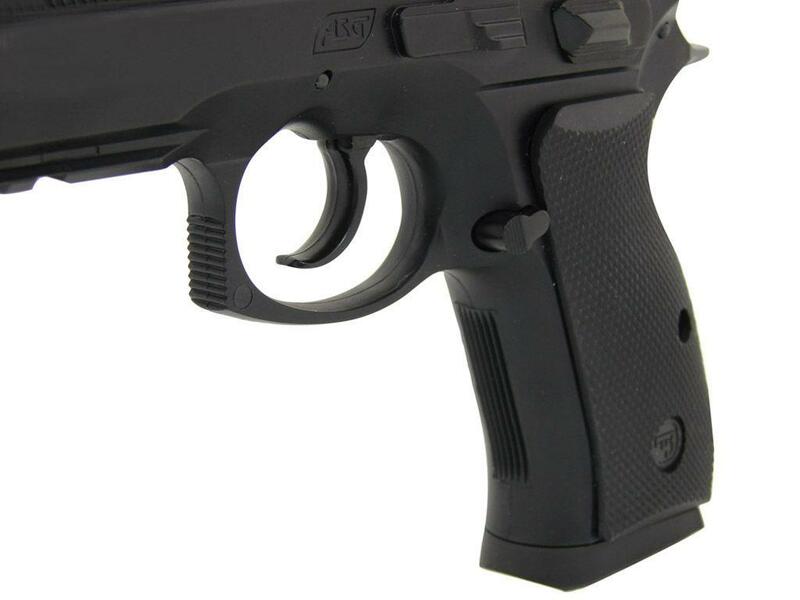 ASG 15564 CZ 75D Compact CO2 Airsoft Pistol | ReplicaAirguns.ca | Easter Weekend Sale! Trigger Pull: The trigger pull on the ASG CZ 75D Compact is fairly light in single action as all the cocking has already been done. When shooting in double action mode, the pull is still fairly light but has a point right before the break where it stiffens up for a moment. This is not too noticeable. Accuracy: My 5 shot Chronograph test resulted in an average velocity of just over 400 FPS, while my 10 shot accuracy test from 30 feet out using a semi-rested position came in at around 2 inches for most of the shots with a few hitting a bit higher. I did have one misfeed which resulted in a double shot for the next trigger pull, those shots obviously did not hit the target as well as expected. For some reason I got a double shot when I tested the 4.5mm Steel BB version so perhaps this is something inherent to this air pistol? In terms of shot placement the ASG CZ 75D Compact CO2 Airsoft Pistol shot fairly well centered left to right but on the high side near the top of the target. You should be able to adjust the internal hop-up to lower the shots a bit if need be. Build Quality: ASG usually distributes high quality guns, and this is no exception. The fit and finish is as nice on the ASG CZ 75D Compact as any other ASG product. The slide wiggle is virtually nonexistent, one of the best I have seen thus far. I would have liked to have seen a metal slide on this one but even so the gun has decent weight and balance to it coming in at 4 pounds in a compact pistol. There is metal where it really matters like in the trigger, hammer, safety, magazine release and of course many internal parts. Realism: The ASG CZ 75D Compact is very accurate replica of the real steel version, with fully licensed CZ trademarks and even the 9x19 caliber markings in the slide ejection port area. The magazine is full metal and full size and does not have any telltale CO2 tab sticking out or elongated area hiding it. Again the metal slide would have finished it off. Comments: I am a bit of a blowback guy so I generally don't look as much forward to reviews of guns without blowback. It was however nice that the ASG CZ 75D Compact does have a moveable slide and it has the least amount of wobble out of any gun I have reviewed to date. I was impressed with the overall performance of this air pistol, nothing stands out but overall it is a nice complete package getting lots of shots per CO2, good FPS, good accuracy, a single and double action trigger, adjustable sights, a rail for add ons, a full size drop out metal magazine and it's a really good overall replica with full CZ licensing throughout. Not bad for a fairly low cost 6mm CO2 airsoft pistol! After 6 tanks it won't seal and is totally useless. CO2 leaks and is always empty or it loses everything when installing a new tank. Looks cool but a slingshot would be a better choice. The price point is more than fair for what you get! Although plastic is doesn't give off that feeling. The marking and design are very nice and is great to shoot. I would have liked to see a slide lock for the moving slide even if it isn't blow back. The most accurate for shooting Iv had, and very good on C02 if you wanna save even more money long term. 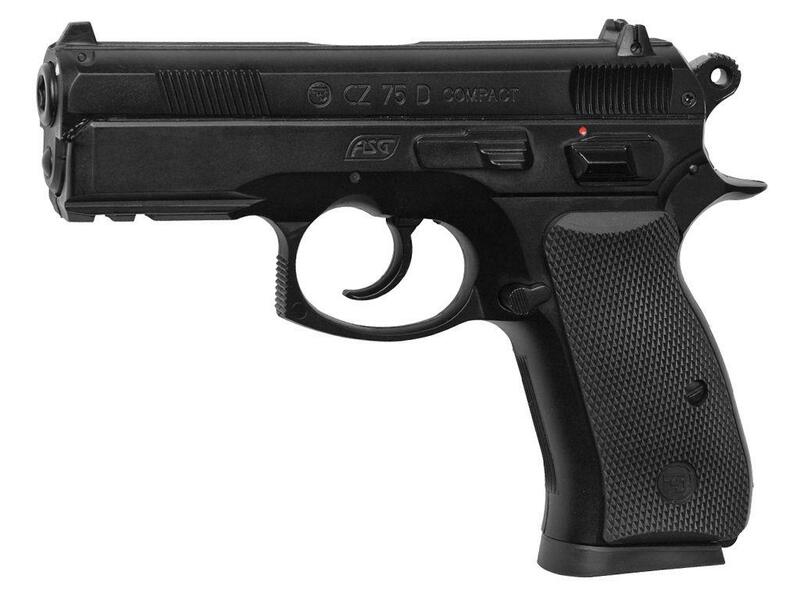 I love the CZ 75D Compact. I had a spring powered version that I enjoyed very much, but it broke after a couple of months. This CO2 version doesn't seem to be as accurate as the spring version, but then maybe I just haven't got used to it yet. The shape of the handle and the rubber grips make it really comfortable to hold. The top of the mag came a little crooked, but it seems to work fine. 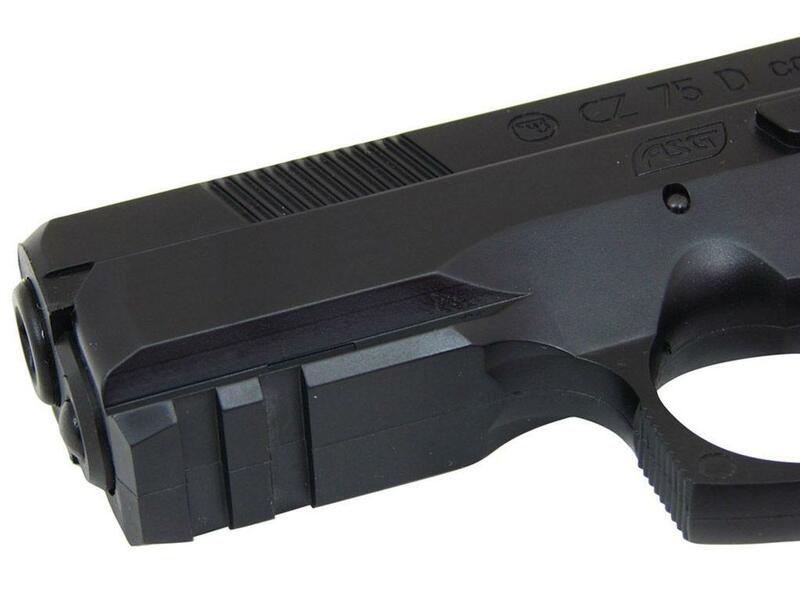 This is a handsome and clean looking compact pistol. You'd be hard-pressed to find a better product at this price. Extra mags are only $18.99 on this site. Again, excellent value. 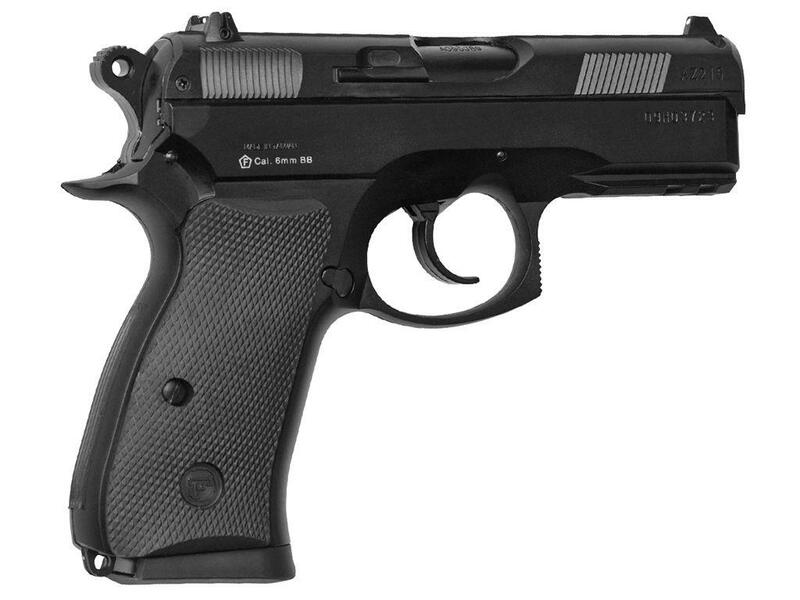 http://www.ReplicaAirguns.com - ASG CZ 75D Compact CO2 Airsoft Pistol Shooting Review. Here is my Field Test Shooting Video Review for the ASG CZ 75D Compact CO2 Airsoft Pistol. Make sure to checkout my previous Table Top Review for more detailed info about the ASG CZ 75D Compact Airsoft version. My 5 shot Chronograph test resulted in an average velocity of just over 400fps while my 10 shot accuracy test from 30 feet out using a semi rested position came in at around 2 inches for most of the shots with a few hitting a bit higher. I did have one misfeed which resulted in a double shot for the next trigger pull, those shots obviously did not hit the target as well as expected. For some reason I got a double shot when I tested the 4.5mm Steel BB version so perhaps this is something inherent to this air pistol? In terms of shot placement the ASG CZ 75D Compact CO2 Airsoft Pistol shot fairly well centered left to right but on the high side near the top of the target. You should be able to adjust the internal hop-up to lower the shots a bit if need be.